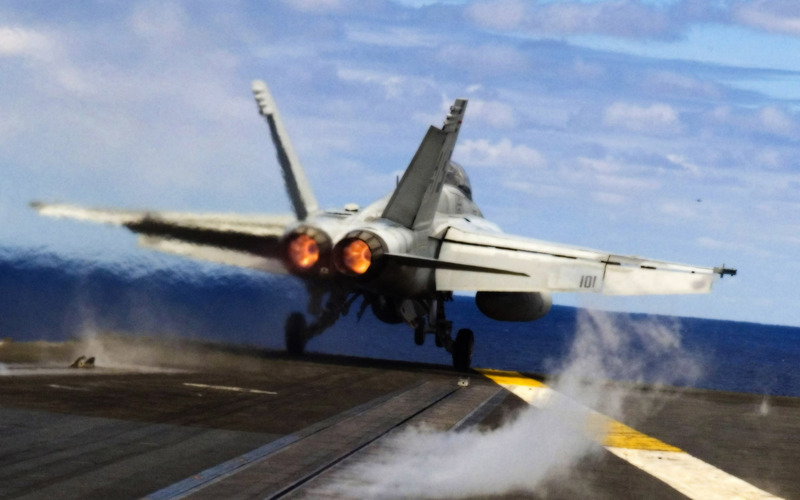 Looking at some videos and photos of F/A-18 Hornets and Super Hornets taking off from carriers and from airfields, I recognised that the left rudder is pointing right, and the right rudder pointing left. Why is that? Are there any aerodynamic advantages? Is it also used as an airbrake to slow the plane down at landings? Does the pilot steer them or is the work done by a computer? The Super Hornet has a living wing, that is to say, the shape of the wing is constantly in motion throughout every regime of flight. Trailing edge flaps, leading edge flaps, stabs, rudders, and ailerons all move in concert to give the pilot the greatest control during particular phases of flight. This is evident by the use of the flaps switch. The three flap positions are, Auto (Up), Half, and Full. Up auto means that the flight control system (FCS) will dynamically change the wing based on what it thinks the pilot is trying to do. However, when the flaps switch is placed in the half and full positions the FCS switches to landing mode, and all flight control inputs will be interpreted as such. Even though the flaps switch has been placed to half/full, the pilot has only changed the FCS logic, he has not actually commanded the flaps to a fixed position. There are no fixed gains (flaps positions) like there are in typical commercial aircraft. Instead, the computer adjusts the flaps position to mimic a flaps half/full position, while also giving the pilot the most stable platform it can for landing. The logic has its limits though and if the pilot exceeds 14 AoA in a landing mode (flaps half or full), the FCS may accidently depart the jet. This is obviously bad 200 ft above the ground. This switch commands the FCS to make flight control decisions and is the toggle between the tactical, and landing modes of flight. The particular effect you are referencing is called rudder toe-in. At slower speeds, particularly during high angles of attack, the stabilators may not provide sufficient nose authority to crisply rotate the nose. The massive wing area of the Rhino tends to block the airflow over the stabs. To remedy this problem the Rhino's rudders will automatically bias to the inside and create a downward force, which pitches the nose upwards. While the rudder is toed-in, the pilot can still use the rudders to yaw the aircraft. The FCS selectively moves the rudder position to generate the yawing motion, even while retaining the fared-in position. During takeoff the rudder will remain in the toe-in position for a fixed 10 seconds after it detects weight off the wheels. This prevents the aircraft from accidentally faring the rudders (and losing nose authority) during one of the most critical phases of flight (AoA probe failures will actually cause the rudders to automatically fare, and this problem is removed by a fixed timing.) During the landing portion of flight, the rudders will also be fared in to give the aircraft more nose authority, and this is handled automatically by the FCS once the pilot commands the aircraft into landing mode by placing the flaps switch out of up auto. While the Rhino does have small speed brakes that extend during full speedbrake deployment, the primary method of increasing drag to rapidly slow the aircraft is through the use of the control surfaces. The FCS will increase the drag by lowering the flaps, toeing-in the rudders, lowing the ailerons, and deflecting the stabs, all while still giving the pilot a stable platform to fly the aircraft--it's an impressive aircraft. During high alpha maneuvering, the Rhino will again deflect the rudders to the toed-in position while the flaps switch is in up auto. With the FCS logic in auto, the computers will attempt to retain control of the aircraft during max performance maneuvers, and will automatically schedule the flaps and rudders to compensate for high AoA and slow speed flight. Because the nose is cocked up and the airflow is disrupted over the stabs, the rudders will again create that pitching force that will assist the pilot in maintaining nose authority through any regime of flight. As stated before, there are times when the rudders may suddenly fare themselves which can have devastating effects during the final portion to land. Rudder failures are serious problems and should be treated as such. Higher landing speeds and extra caution will be used, and the pilot should understand that wave offs may be impossible due to lack of nose authority in close to the ramp. 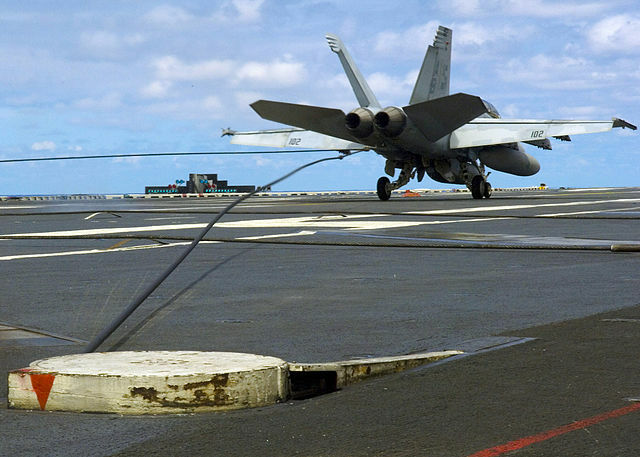 The rudders are deflected inwards during takeoff of the F/A-18E to help in raising the nose of the aircraft as it leaves the ship. As the vertical fins are canted outwards, deflecting both the rudders inwards generates a downforce, which, due to its location aft of the center of gravity, creates a pitch-up moment. 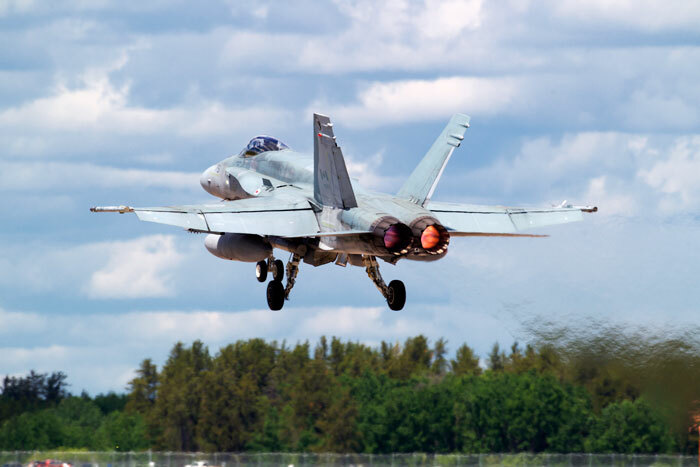 This position of rudders during takeoff is common to all F-18s, including the Canadian CF-18s, which are not used in carrier operations. 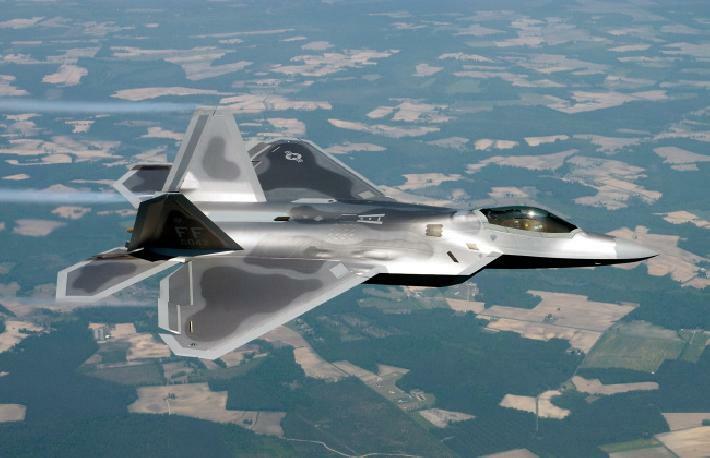 Almost all aircraft with a canted tail (F22, F35, etc.) can (and do) use their rudders for pitching in concert with elevators. The rudders are used during landing too. The principle is not much different and the FBW computer handles all these control surface operations usually. The rudders are also used as airbrakes. The F18 had an airbrake, which was removed in F/A-18E/F, and the control surfaces are used as airbrakes. "FA-18 Trap" by Original uploader was E2a2j at en.wikipedia - Transferred from en.wikipedia; transferred to Commons by User:Mo7amedsalim using CommonsHelper.. Licensed under Public Domain via Commons. The rudders are in this position during takeoff/landing and once the aircraft is cruising, they become inline with the vertical tail to reduce drag. However, they can be used for decelerating the aircraft in flight, if required. Again, it is the computer which does the work. The real reason: Ground effect was not considered during development. 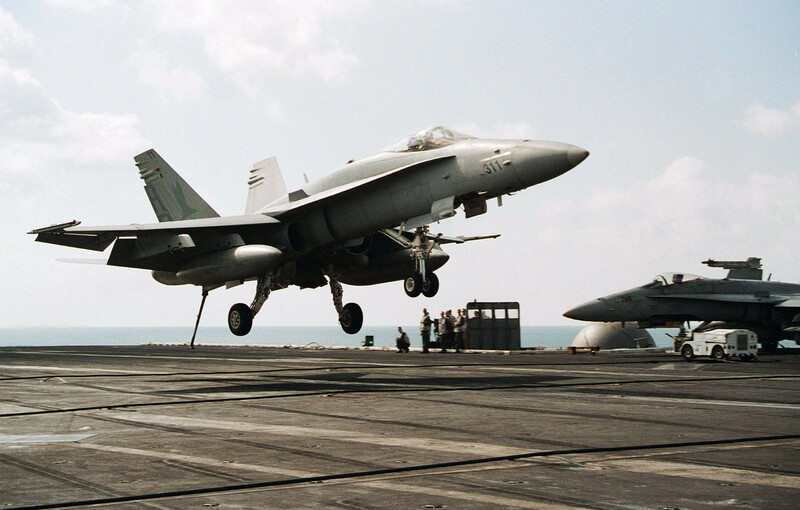 When the first F-18 fighter […] was flight tested at Patuxent River, it became evident that the airplane would not rotate at the predicted speed. This made the field performance of the airplane unacceptable. The problem was traced to an error in the calculation of aerodynamic forces in ground effect. This is particularly severe in case of a low placed horizontal stabilizer. As a result there was insufficient down-load capability to effect early rotation during the takeoff ground roll. The problem was fixed by toe-in of the rudders. A squat-switch on the main gear biasses the rudders to deflect inward while on the ground. This creates enough positive pressure over the aft fuselage to effect early rotation. This fix, although impressive, came at a price. All flight control software had to be revalidated. Also, the squat-switches represented additional system complexity. It's the rudders acting like a ruddervator to assist in pitching up. This is possible because they lean outwards a bit. Not the answer you're looking for? Browse other questions tagged aircraft-design aerodynamics military takeoff aircraft-carrier or ask your own question. When leaving ground effect, why is there a nose-up change in moment? Why do tailplanes provide down force, if not for longitudinal static stability? What is the direction of the sideslip induced by roll on a conventional aircraft? What are the effects of crosswind on takeoff?